The Appalachian Trail is one of the most iconic scenic hiking trails in the world and it has a number of access points in the Roanoke Valley in Virginia&apos;s Blue Ridge. 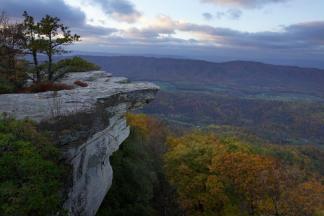 Roanoke is actually the largest city located along the Appalachian Trail. At approximately 2,200 miles in length, the Appalachian Trail, or A.T., is revered among outdoor enthusiasts as a challenging and breathtaking path that provides one of the most unique nature experiences on earth. The northern trailhead is at Mount Katahdin in Maine while the southern trailhead is at Springer Mountain in Georgia. It is reported to take 5,000,000 footsteps to hike the entire trail and an estimated 2-3 million visitors hike a portion of the A.T. every year. In Virginia&apos;s Blue Ridge, the Appalachian Trail follows a path parallel to Interstate 81 as it winds through large portions of the George Washington & Jefferson National Forest. Download a full map of the Appalachian Trail from the National Park Service. The following main entry points are from north to south on the A.T. The Appalachian Trail runs parallel to the Blue Ridge Parkway from Milepost 90-97 between Blackhorse Gap and Bearwallow Gap. There are multiple spots along this portion of the road that provide opportunities to hop on the A.T.
As you travel north on Route 11 from Exit 150 at Interstate 81, the parking lot for this entry point is approximately 3/4 mile from U.S. 220 Alt. and located on the right side of the road. Look for the Appalachian Trail and Troutville signs. The lot also has an A.T. informational kiosk. There is a gravel parking lot off U.S. 220 beside the Exxon Gas Station. Behind this parking lot is a dirt path that makes its way up the base of Tinker Mountain and connects to the Appalachian Trail. The gravel parking lot at the top of Catawba Mountain on Route 311 is a crossover point for the Trail. This is also the beginning of the popular McAfee Knob trail. The parking lot for the Dragon&apos;s Tooth trail off Virginia Route 311 quickly connects with the Appalachian Trail. The nearby Catawba Grocery, which is less than a mile south from the parking lot, is also a great spot for snacks and supplies. The following is a list of official shelters in Virginia&apos;s Blue Ridge with the designated Appalachian Trail waypoint and GPS coordinate information. Mileage decreases from north to south. Learn more about shelters on the Appalachian Trail with the interactive map from the Appalachian Trail Conservancy. McAfee Knob: one of the most photographed spots of the Appalachian Trail and one of the best views in Virginia&apos;s Blue Ridge Mountains. This summit of this hike includes a 270-degree view of the surrounding mountains. Tinker Mountain: the views from the top of Tinker Mountain are well worth the work exerted in the climb. One direction provides a beautiful look at the Carvins Cove Natural Reserve, while the other direction offers a glimpse back toward the city of Roanoke and surrounding Roanoke Valley. Apple Orchard Falls: visit one of the most beautiful waterfalls in Virginia with a hike along the Apple Orchard Falls trail. Much of the trail follows the streams in the area and it culminates at the 200-foot falls. Dragon&apos;s Tooth: as one of the tougher hikes in the region, the Dragon&apos;s Tooth trail features many unique geological features and offers an incredible view at its summit. Scale the Dragon&apos;s Tooth at the summit for a 360-view that will leave you speechless. Triple Crown: combine three of the most popular hikes along the Appalachian Trail in Virginia&apos;s Blue Ridge to complete the Triple Crown. 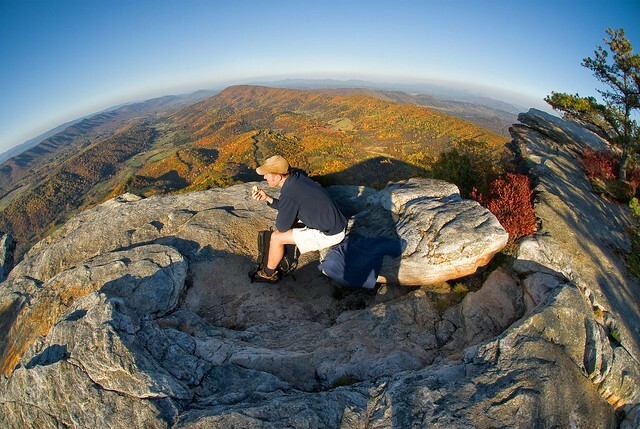 McAfee Knob, Dragon&apos;s Tooth and Tinker Cliffs are the three segments that make up the crown, and they can also be joined together to create a loop-hike that&apos;s also a great overnight backpacking trip. The Roanoke Valley has been named "Best Trail Town" by Blue Ridge Outdoors Magazine for its amazing selection of trails. Learn more by viewing our complete list of hiking trails in the Roanoke Valley. The above map features key points of interest in Virginia&apos;s Blue Ridge, including parking areas, camping shelters, and popular hikes. You can also download this Appalachian Trail map that shows the complete trail. There are a variety of activities near the Appalachian Trail, including fantastic options for dining, accommodations and local attractions. The Homeplace, located on Route 311 at the base of Catawba Mountain, has become a legendary spot for hikers who enjoy a delicious, all-you-can-eat Southern meal while taking in the beautiful surroundings. Nearby Salem offers the opportunity to enjoy a Salem Red Sox baseball game, shopping along its quaint Main Street, award-winning craft beer at Parkway Brewing Company, performances at the Salem Civic Center, and plenty of lodging options. Botetourt County features a great selection of convenient accommodations near the trail, with the Super 8 and Howard Johnson Inn near Exit 150 off Interstate 81 within walking distance of the base of Tinker Mountain. Botetourt County also offers delicious dining options such as Three Li&apos;l Pigs BBQ, Cracker Barrel, and Town Center Tap House.